Classic Auto Renderings has made the decision to not renew licensing with Carroll Shelby. Prints depicting their vehicles will not be available for purchase on this site. However commissions fo one off paintings are accepted. “The Americana Series” collection of artwork depicting classic and special interest American cars over a backdrop of famous American landmarks, events, symbols or monuments to American history. 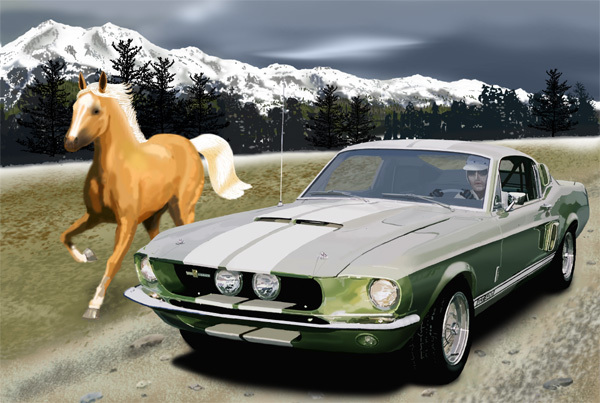 Alongside the 67 Shelby GT 500 is an American Palomino Quarter horse. There is a long history of quarter mile races going back to colonial days and now used to measure acceleration in automobiles. The car belongs to Freddy Haugvik a Norwegian friend. 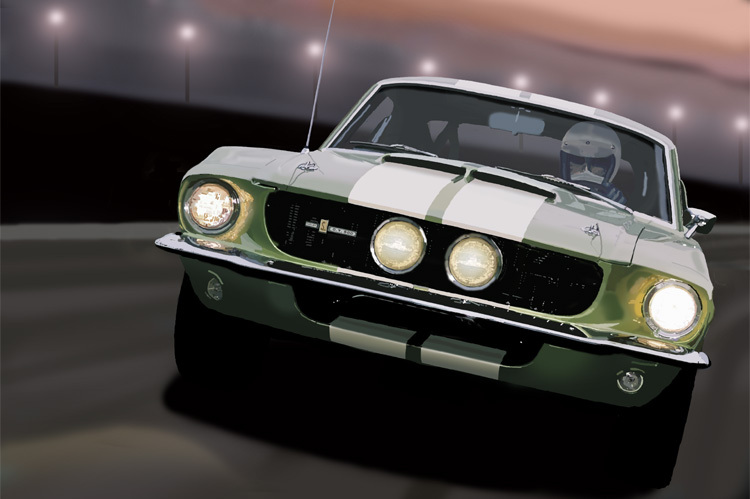 The 67 Shelby GT 500 with the 427 engine is depicted testing for an endurance race during the early dawn hours. This is a very rare Shelby. The car belongs to Freddy Haugvik a Norwegian friend. SHELBY GT-350™ and SHELBY GT-500™ are registered trademarks owned by Carroll Shelby and Carroll Shelby Licensing, Inc.